The Celtics came out of the Weekend back over .500 as they won both games over the Nets and the Knicks. The Celtics beat the New Jersey Nets 107-94 and the Knicks 115-111 in overtime. Pierce was the leading scorer in both games as he scored 27 and 34 points. Kevin Garnett had double-doubles in both games as shot over 50% for the weekend in total. But the weekend belonged to Rondo. Rondo had 14 points and 13 assists in the first game, and then exploded Sunday for 18 points, 17 rebounds, and 20 assists. 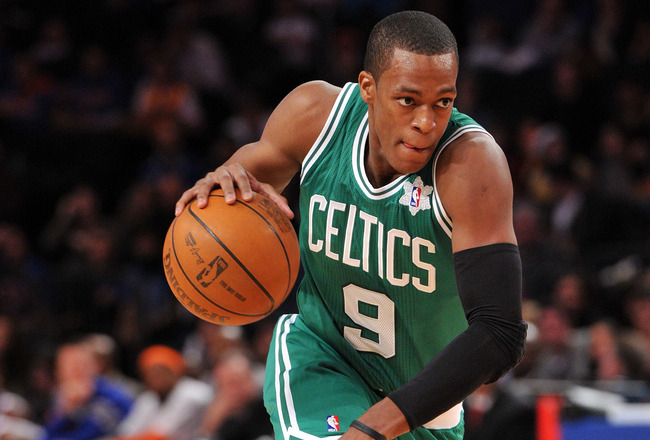 This was the third game in the last three weeks where Rondo had a triple double, and his fourth of the season. According ESPN Rondo joins Wilt Chamberlain and Oscar Robertson as the third NBA player in history to have over 15 points, 15 rebounds, and 20 assists. Add in all the missed layups Rondo had in the game and he could have easily had 25-30 points. Rajon also became only the 3rd player in the last 25 seasons to have over 15 points, assists, and rebounds in a single game, joining Jason Kidd and Magic Johnson. Shout out to my friend Cody for this stat, the NBA has had 10 triple-doubles this season, and Rajon Rondo has four of them. He has been the only player with more than one triple-double on the season. Ever since the Jermaine O’Neal has been out with his injured wrist, KG has slid over to the five position. It has been huge for the Celtics. The rebounding has been better, and KG’s defense on the 5’s has been great. He has also been able to get his shot off better as the 5’s do not want to come out as far to defend KG and let him drive by for the easy two. If or when O’Neal comes back, the Celtics should stick with KG at the five and have Jermaine come off the bench. Bass and Wilcox are playing too well at the four to have both of them come off the bench for the rest of the season. The Celtics play next on Tuesday at the Garden against the Houston Rockets at 7:30 PM. This entry was posted in Celtics and tagged boston celtics, boston sports blog, celtics, Elias, ESPN, Jason Kidd, Jermaine O'Neal, Kevin Garneet, kg, knicks, Magic Johnson, Oscar Robertson, rajon rondo by leibo4. Bookmark the permalink.